Each ITP & Platelet kit contains one bottle of Blood-SP and two bottles of Immune-SP. This product combination is recommended as nutritional support people suffering from low platelet counts caused by ITP (both Immune and Idiopathic Thrombocytopenic Purpura) . 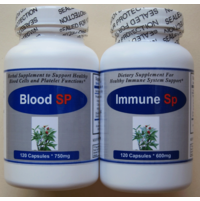 Selected herbal ingredients in Blood-SP and Immune SP play a vital role in assisting the body's natural mechanisms to promote healthy blood coagulation and reduce excessive bleeding due to various causes. Restructure and heal the body from destroying platelets. Eliminate the possible triggering of disease maintaining factors. Improve the immune function that prevents excessive platelet destruction. Eliminate the side effects of the standard drugs commonly used and prescribed for ITP, thus allowing a return to a healthier balance. Suggested Usage: As a dietary supplement, take 3-5 capsules each time, two times a day, or as suggested by a healthcare provider. My son has been using the ITP & Platelet kit for about 6 months now. We starting at 60K and within 2 weeks went up to 102K. Platelet counts fluctuated a bit and now he has been steady at around 177 - 200K. It took about 3 months to get above normal and I plan to keep him on them for at least a year and then cut the dose in half for another year (Dr. Ba's recommendation). They have been wonderful for his energy level and bruising. I have not seen an "ITP bruise" on him since we started them. Great stuff in my opinion. I recommend them. Our philosophy is to look at ITP (both Immune and Idiopathic Thrombocytopenic Purpura) as a whole body imbalance. Our goals are to improve the immune function, platelet quality and endothelial integrity in order to prevent and stop excessive bleeding symptoms. Our herbs can rebalance the body allowing its own mechanisms to restructure and heal the body from destroying platelets. This specialized formula was first developed 30 years ago due to a lack of adequate and effective treatments available in Western medicine. It has helped thousands of individuals with ITP and other bleeding disorders to achieve a better quality of life and long and lasting results. Standard dosages: Take 2 tablets of Blood SP and 4 capsules of Immune SP twice daily on an empty stomach (30 min - 1 h before meals). The initial herbal supplement program is three months to help the body to achieve significant relief in ITP (Immune Thrombocytopenic Purpura) symptoms. For people with ITP resulted from inherited low platelet, Evans Syndrome, Lupus, common variable immune deficiency and people who have been on a very high dosage of corticosteroids, repeatedly on Winhro or IVIG infusion, we often recommend higher doses of our herbal supplements. Generally we recommend people to take the ITP & Platelet supplements for a period of a year, which gives the body a chance to become balanced and stable and stop destroying its own platelets. Note: For people with very low platelet counts (<25K), Agrimonia can be taken with ITP & Platelet kit for complete support.